Abstract--We use a function transformation that leaves volume unchanged as the basis for geometric model of muscle contraction. The model is built after making an experiment on a frog leg muscle under single electrical stimulus. Index Terms—Geometric model, muscle, electric stimulus. Geometric models of different skeletal muscle with mechanochemical properties have been used for some time . Pure geometric model can be used to calculate contraction from radial displacement or vice versa. At Faculty of electrical engineering a new non-invasive method called tensiomiograpy (TMG) has been developed . The method enables selective measurements of particular muscles. 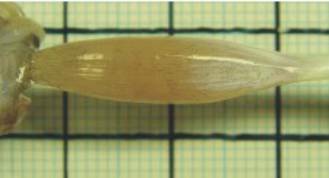 This method is based on magnetic displacement senzor detecting the muscle belly enlargement in radial direction. The figure 1 shows the basic principle of TMG. In studying a muscle as geometric object we limit to simple geometric shapes. This means that the radial cross section is an ellipse. 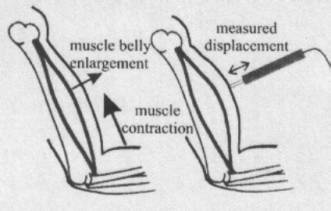 We make also a natural presupposition that the volume of a muscle remains unchanged during contraction. On frog’s (Bufo bufo) leg muscle (gastroncnemius) strained with almost constant force of 0.34 to 0.42 N (isotonic conditions) a single electric stimulus was enforced. The muscle contracted from 25 mm to 18 (or 17) mm. The radial enlargement from top view was from 6 to 8 mm (figures 2, 3). The radial enlargement from side view was from 5.75 to 6.5 mm (figures 4, 5). The difference of radial enlargements among both views was significant. The volume of the muscle was 400 mm3. The experiment has been carried out at Biotehnical Faculty. The figure 8 shows both (enlarged) cross sections. Parameters a in b are the beginning and the end of the muscle. We know that f(mx), m>1, means shrinking of function f along x axis for factor m. Note that function g(x)=Ömf(mx) determines the same volume on interval [a/m,b/m] as f(x) on [a,b]. In our case the shrinking factor m=25/18=1.39 (or 25/17=1.47). This means that the average radial enlargement equals Öm=1.18 times average radius of the beginning state of the muscle. Suppose the cross section is an ellipse with half-axes y and z. If the radial enlargements in directions of y and z axes are h and k respectively, then hk=m. In our case h=1.33, k=1.13. The product is 1.5. The relative error 0.11/1.5=0.07 (or 0.03/1.5=0.02) occurs because the real muscle is not as symmetric as we supposed (figure 9). Using a function of type a(1-x2/c2)f has the advantage that the integral of its square can be calculated analytically. Also the maximum value a is achieved at x=0. Since there are only 3 parameters we can model only 3 quantities. We take volume, maximum end length of the muscle. We experimented also with some other three parametric functions: ax(x-b)(x-c), a(1-x2/c2)/(1+bx2). The main problem of functions is to find critical points. Even in case of polynomials of degree more than 2 we get nonlinear equations and if the degree is more than 5, the first derivative has degree more than 4 and the equation f’(x)=0 is not solvable (by formula). Generally shapes of human or animal muscles are too complicated to be treated by mathematical formulas. In some cases a muscle has relatively simple form and it is possible to find a mathematical function that aproximate the muscle’s shape. We have investigated one such muscle, but generally the problem remains open. A. Belič, N. Knez, R. Karba, V. Valenčič, “Validation of the human muscle model”, Proceed. 2000 Summer Computer Simulation Conference, 16.-20. July 2000, Vancouver, British Columbia. Session 1: Issues on Whole Body Modeling. N. Knez, V. Valenčič, “Influence of impulse duration on skeletal muscle belly response”, Proceedings of the ninith Electrotechnical and Computer Conference ERK 2000, 21.-23. September 2000, Portorož, Slovenia, Ljubljana: IEEE Region 8, Slovenian section IEEE, 2000, Vol. B, pp. 301-304.